Developing reconstruction design of the industrial object, an accurate and actual spatial data are required, as well as an information on the geometry of the facilities under reconstruction. Those data could be obtained by means of the drawings vectorization, – as rule, of previous design, out-of-date and incomplete, – or by means of the industrial object complex investigation. Often, those drawings have been lost, damaged or absent in general. 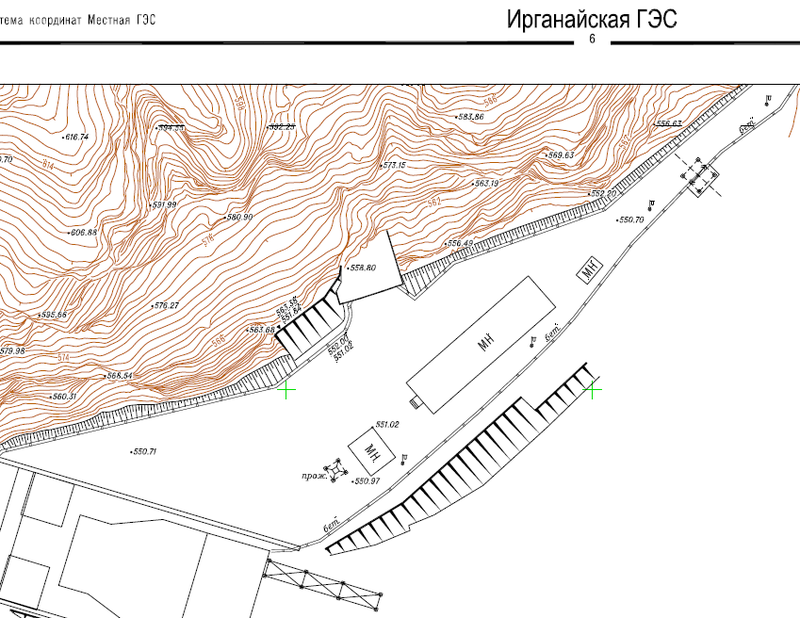 To this end, the investigations are required, because it’s necessary to perform fast and accurate measurements of a complex equipment, or shop as a whole, or industrial site, and report the results obtained in the digital 3D form, – that is the results that could be used as a basis for a CAD system design. 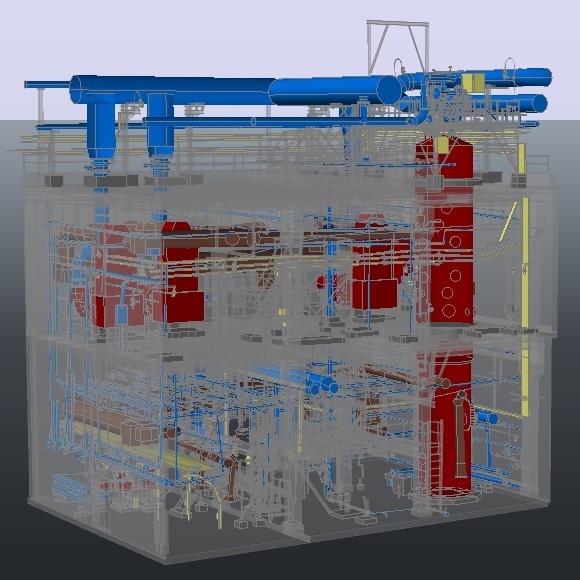 At the present time, there is a technology providing the solution to the problem of obtaining an accurate 3D model of an integrated facility – this is the 3D laser scanning technology. The 3D laser scanning is the technology providing output of the digital 3D model of industrial objects, being unparalleled in (geodetic) survey capacity and efficiency. 3D scanner is an instrument that, performing up to one million measurements per second, represents the objects in a form of the point set with the spatial coordinates. The data array obtained, referred to as the “point cloud”, could be represented hereinafter both in 3D and 2D form, and as well used for carrying out measurements, calculations and analysis. Though the pioneer laser scanning systems have been entered the market relatively recently, this technology have shown its high efficiency, and supersedes actively the less productive survey methods known. small fraction of the field reconaissance stage belongs to general effort. During shops and industrial sites reconstruction, being replete with processing equipment, the spatial information on the existent equipment and engineering structures is of great importance. The information of the kind could be stored and processed in the form of 2D drawings on hard copy (that as well often do not comply with reality), while it could be stored and processed in the form of actual 3D model. 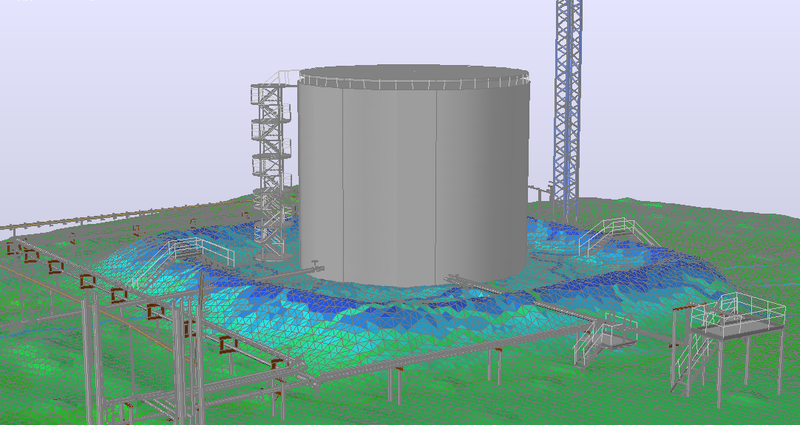 The 3D model of the existent facility provides not only perform design reconstruction correctly, but also allows to decrease essentially (from 0.3% to 10%) costs of collisions elimination during the construction phase; in the end, the enterprise reconstruction process as a whole would be cheaper and faster. There are several ways of 3D modeling of process equipment; all of them, in any event, are measurements related. The cutting-edge and most effective is the terrestrial laser scanning method. This method is widely applicable for carrying out of complex measurements in 3D space. The application efficiency of the 3D scanning technology is deservedly estimated by the leading design companies. Only 10 years have been needed for the 3D scanning technology to revise the conceptions on complex objects measurements in 3D space, allowing to simplify and make cheaper the reconstruction process. The first-rate world manufacturers of CAD systems, – such as AVEVA, Intergraph, Bentley, Autodesk, – have now included into their software the 3D scanning data processing functions. “As is” knowledge about the existent manufacturing, that obtained not from obsolete drawings, not by means of hundreds of manual measurements, but using the highly effective laser scanner allows significantly cut down the design-and-development, assembly and construction expenses. At following-up of the industrial and civil engineering buildings and structures, often, instead of traditional optical and satellite measurement means, it is preferable to apply laser scanning. The core advantage of the 3D scanning technology, in this case – operability of the data obtained. At the objects with high rates of construction, high density and great amount of objects under control, it is necessary to maintain a team of specialists that perform daily measurements. Besides the high cost of those works, the human factor influence is inevitable that cause delays in schedule times and appreciation of the construction works. Application of the 3D scanning technology allows to minimize the human factor influence based on high degree of data acquisition automation. At present moment, the 3D laser scanning is the most effective technology for obtaining the 3D model of a building, at any phase of construction process, for subsequent import into CAD or BIM, and also for comparison with the design data. Frequently, there is no necessity to build a 3D model, since the tasks of construction process control are solved based on the immediate scanning result – the point cloud. Upon a tank having been built or renovated, a necessity arises of building the calibration charts that define the dependence of a liquid volume vs poured liquid level. The rate of obtaining the spatial geometrical information about the tank by means of the laser scanning method allows to create such tables faster and more accurate compared to the existent pouring or geometrical methods. In addition, scanning makes essentially easier the tank geometry control. Virtual tour, or interactive 3D application is the software product that provides visualization, navigation and interaction with the 3D model. Virtual tour allows, – similar to a computer “browser and shooter”-game, – to travel within the 3D model representing a real existent object or object under design, to carry out various actions. Thanks to being highly realistic, the 3D model allows to obtain a user immersion effect into the object represented. Virtual tour is, per se, implementation of virtual reality. The interactive 3D application could be used effectively at all phases of an industrial object life cycle: from its design to its dismantling. The application either helps to resolve a highly tailored task, or can be a part of an enterprise automated management system, and to be operated by a complex variety of specialists’ teams: operators, engineers, maintenance experts, firemen, security. The application provides the operating organization management, owner of the industrial object an ample opportunities for monitoring of various processes progress at the enterprise, the object current status evaluation, forecasting of possible scenarios of situations development. development of the enterprise automated management systems. 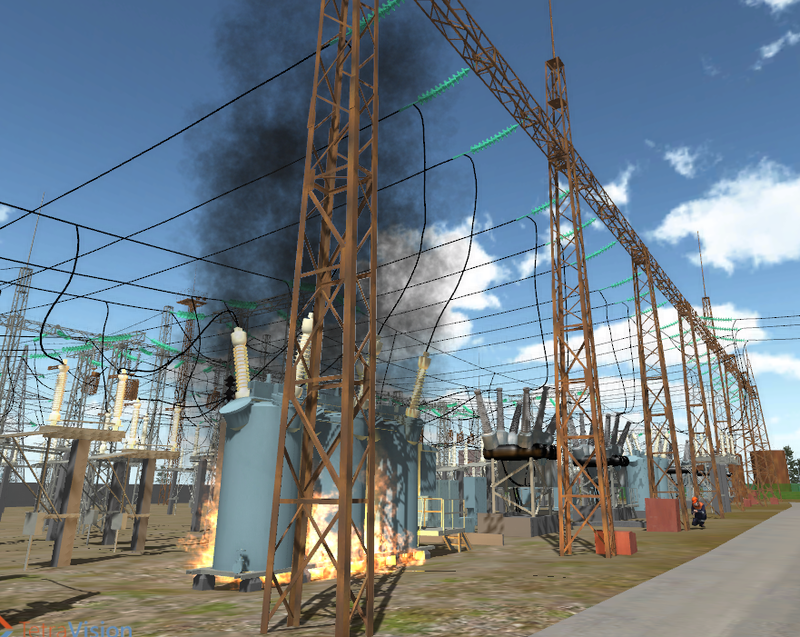 Every object in the interactive 3D application is matched up to an attributive information that could be obtained and edited by a user, immediately from the 3D model. Private construction makes actual the problem of the general layout renewal. By means of the 3D laser scanning technology, it becomes possible to perform on-the-fly the geodesic survey of a huge territories with the high density of development. At the scanning works being performed periodically, the opportunity appears of survey results comparison over various periods of time. The comparison takes place in 3D form, and the process becomes simple, comprehensible, and excluding frequent errors. The 3D laser scanning technology resolves the tasks of earthwork follow-up, amount calculation of excavated/scattered ground, measuring residues at the bulk materials storages. Often it is difficult to calculate the amount of the actual movement of the breed during excavation, inventory and accounting of bulk materials. Laser scanner successfully perform the job. Fixing the surface microrelief, scanner determines the amount of excavated or filled ground, the bulk material. When cyclical nature of the work there is possible to compare different periods of DEM. In this case, the calculation is carried out not only the volume of the displaced material, but also mapping, that helps to define the location of the changes. The materials are followed by the completed work report, including the report on networking of the geodesic survey substantiation, report on accuracy checkup. In the second case, the routine, creation of the solid model based on the point cloud is performed in the intended software, at our side. Ultimately, you get the file with the 3D model. In the first case, raw material is loaded into CAD system – the point cloud. 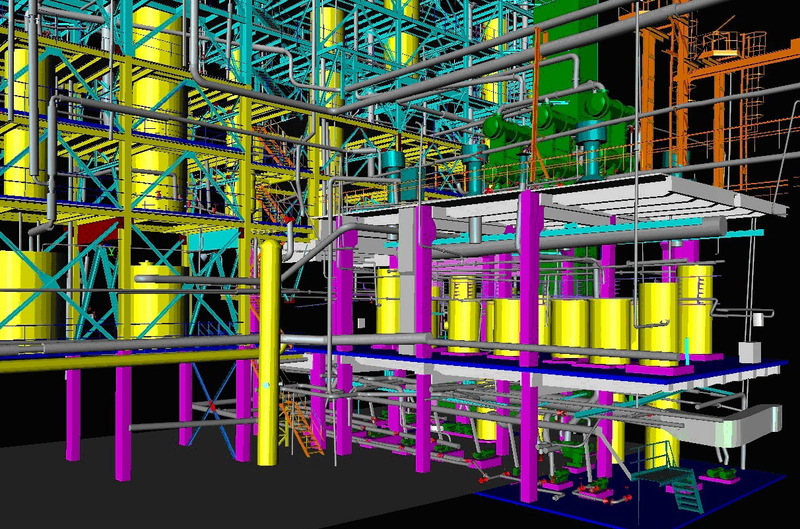 The CAD systems manufacturers AVEVA, Intergraph, Autodesk, et al., already possess the complete solutions for processing the point cloud. Additionally, there are a series of companies producing plugins for routine CAD systems: Pointools, Kubit (PointCloud), Leica (CloudWorx), AliceLabs, et al. The similar plagins are capable not only load the point clouds into the standard design systems, but also to process those data, at a well serious level. The point cloud is a kind of spatial subtract for further design, and carries inside it the information only about the object geometry. The option with the point cloud is faster than the first one, and is, respectively, cheaper. The intellectual model is built based on specifications, – it is the most long term and cost-is-no-object option. In some cases, it is preferable to use a combined approaches, – for example, make a model of a part of territory, while having a point cloud for the remaining part. Trimetari Consulting LLC has a greate experience in laser scanning and 3D-modeling in industry. Some cases are published at Projects page. Please contact us using Contacts page, so we can discuss your needs, estimate the cost of laser scanning and timeframe of your project.